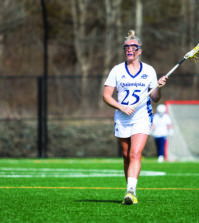 The Quinnipiac women’s lacrosse team (5-9 overall, 1-5 MAAC) battled it out with the top seed in the conference in the Canisius Golden Griffins on Saturday afternoon in Hamden, but ultimately fell 12-7. Canisius’ junior attack Jourdan Roemer led the way for the Golden Griffs with four goals and five assists, good to bring the MAAC leader in points to a total of 65. 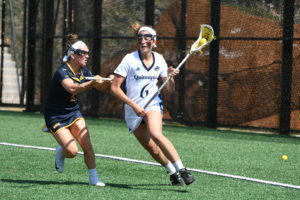 Quinnipiac’s sophomore attack Ashley Bobinski and junior midfielder Allison Kuhn each contributed three points for the Bobcats on their Senior Day. Canisius and Quinnipiac exchanged goals in the first few minutes, making it 2-2, but Canisius then went on a 6-0 run and closed out the half leading 8-2. Roemer was good for two goals and four assists in the half, with sophomore midfielder Bryar Cummings, senior attack Allie Stewart and senior midfielder Jen Reininger all collecting two goals for the Golden Griffs. The second half showcased a much different Quinnipiac team. Sophomore Allie Kelsey replaced senior Kyle Larkin in net at the start of the final 30 minutes, as Larkin finished her day recording two saves. It wasn’t just the personnel that changed with Quinnipiac battling throughout the half. The Bobcats fell down early 10-4, but were able to scrap three goals and close the gap to 10-7 with about five minutes left. However, Reininger’s third goal stopped the comeback and Canisius would hang on to win 12-7. The Bobcats only have two games remaining in their season and currently sit eighth out of nine teams in the MAAC. While a MAAC tournament berth looks bleak, the team won’t be giving up in their final matchups. “It’s not over until someone tells us it’s over,” Kelly said. Quinnipiac may not have gotten the result it wanted, but it was able to celebrate its four seniors in a pregame ceremony. Senior attack/defender Caitlinn Riedell, senior attack Loren Antonacci, Kelly and Larkin were all recognized with family members and teammates surrounding them. 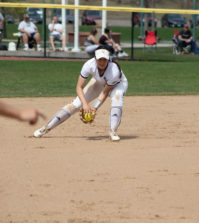 Quinnipiac’s next game will be Wednesday, April 18 against Siena (4-9 overall, 0-4 MAAC) at 3 p.m. in Loudonville, New York.